One of the most exciting events of our vacation was at the Everglades. 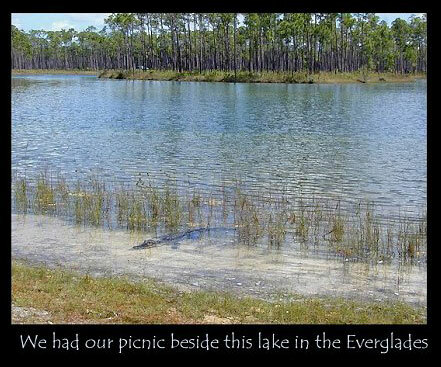 We picnicked near the water and were visited by a bold six-foot alligator. He was evidently accustomed to people feeding him, but we kept our distance and didn't encourage the prehistoric reptile. We watched him carefully as he lurked at the waters edge, and more than once we climbed on the picnic table when the hungry critter moved out of the water a little too close.